A great choice for a pre-Christmas break, historical Zagreb is bursting at the seams with fun, culture and diversity to rival any European capital. Once a secret, this city's Christmas markets are now voted the best in Europe! 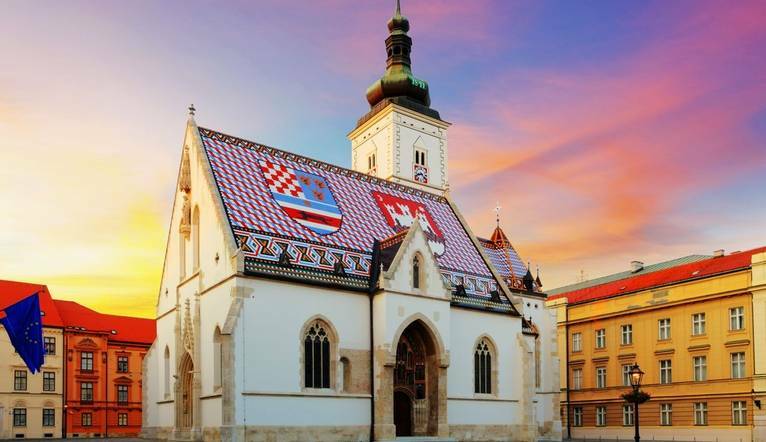 Dating back to 1094, Zagreb is ranked as one of the oldest towns in Central Europe. Old-world charm combines with fashionable boutiques, elegant restaurants and a Baroque atmosphere. Our guided sightseeing tour introduces us to the highlights of the upper town including Gornji Grad; the Presidential Palace and its colourful guards; and St Marks Church, the lower town and the main square. It’s a great city for strolling around, stopping for a coffee or popping into one of the excellent museums and galleries. With the glorious smells of cinnamon, cloves and mulled wine mixed with thousands of twinkling lights, the world-renowned Christmas markets with their wooden booths, live music and delicious local specialities give us the opportunity to shop for unique gifts as we stroll through Zrinjevac Park or EU Square. Just north of Zagreb is Trakošćan castle, one of the prettiest castles in the whole of Croatia. Built in the 13th century, with many architectural features, we can enjoy a guided tour here before taking a walk around its large beautiful lake. It’s then on the town of Varazdinis for a tour before lunch (own cost). Formerly the capital, the town is known for its magnificent baroque buildings which have been meticulously cleaned and looked after. We will have time to explore the pedestrian zone and the old streets before heading back to Zagreb. Our hotel is located in the main city square, and the historical upper town, shops, bars and restaurants are all just a short walk away. This warm and welcoming hotel offers a bar/lounge, restaurant, café serving fresh pastries and small fitness centre. The classically decorated rooms feature satellite TV, air-conditioning, a telephone, safe, minibar, hairdryer and free Wi-Fi. The transfer time from Zagreb Airport to Hotel Dubrovnik is approximately 40 minutes depending on traffic. During your holiday, we have included a guided walking tour of Zagreb and a day tour to Varazdinis & Trokoscan Castle. Listed below are just a few of the optional tours that may be available to you depending on the time of year and numbers interested. Prices will be advised depending on numbers at the information meeting as these trips may run as private trips or you may be joined by other holidaymakers. All tours can be paid for in local currency (kunas) or Euros but in cash only. The exact amount will be given at your Information Meeting. Your Tour Leader will help arrange these for you but may not necessarily accompany you. Your Tour Leader will be on hand to offer advice or suggestions if required but gratuities are offered entirely at the sole discretion of the individual. We suggest a group collection to cover drivers, porters and hotel staff of €15.00. Your Tour Leader will collect this on your behalf and distribute it accordingly, thus relieving you of the burden of who, when and how much to tip. The tipping of housekeeping will be left to your individual discretion (a small amount left in your room on departure should cover this and would be much appreciated). As is customary, ‘the hat’ will be passed around for the driver and guide on all optional excursions. For any meals that are not included in your itinerary, or taxi fares, your Tour Leader can advise of an appropriate add on. Casual daytime wear is recommended. Comfortable shoes are a “must” for sightseeing. Smart casual clothes will be ideal for the evenings - the emphasis throughout being informality.